This recipe is from Betty Crocker's 40th Anniversary Edition Cook Book. The problem with "upgrading" from one cook book to another is that the new version might not have all your favorite recipes from the old one. So this is one of those recipes that I can't find in the new BC cook book. (I think it's in there, but it's hidden within another cake recipe.) As I transfer cook books, I'm hoping to get all of my old favorites listed here so they're easy to find. I like using this snack cake when I make a trifle (which Melanie got me hooked on. I'd never heard of a trifle before she posted a lavish photo spread of one she made.) The cake tends to be a bit dry on its own. Heat oven to 350° F. Mix ingredients together and pour into an 8x8x2 in. pan. (The directions say to hold back the chips and sprinkle them on top, but I've also made it where I've just mixed them in. Bake 35 to 40 minutes or until wooden pick inserted in center comes out clean. Cool, sprinkle with powdered sugar or slather jam on top as I do. 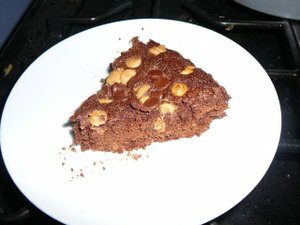 I've also made this where I sprinkled chocolate and peanut butter chips on top. (As pictured.) The only problem with this is that the cake is really too dry without something custardy poured on. But once I put the peanut butter chips on it looks done and I tend to skip the custard. mmm.. I made trifle again this week for a mac and cheese extravaganza I went to. It was a hit. my sister made one for my nieces 6th birthday last week, she did chocolate cake, chocolate pudding, whipped cream and cherry pie filling, for a black forest version.